Are you dependable, compassionate and looking to make a difference in someone's life? 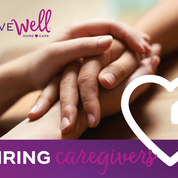 Join the LoveWell Team! Our caregivers work to assist and support older adults with daily activities of living. This includes conversation, errands, meal preparation, light housekeeping as well as personal care. LoveWell provides training, competitive wages, a flexible schedule and a culture of appreciation to our team! Please call 248-773-7660 for more information.